‘Unmistaken Child’ Is an Unmistakenly Beautiful Film! When I reserved my tickets for a special members’ screening of the documentary ‘Unmistaken Child’ at the Rubin Museum of Art in NYC, I knew I would be privy to a beautiful film about the spiritual and antique traditions of Buddhism, complete with the uplifting experience such a film typically leaves the viewer with. What I didn’t know was that the film would touch me deeply and emotionally, with a sense of love, longing and tenderness. Tenderness for the chosen golden child in the film, as well as the devoted disciple Tenzin Zopa, a young, charming and well-spoken monk who spent most of his developing years in the kind shadow of his ‘charge’, an elderly Lama with a penchant for flowers. When Lama Konchog dies, Tenzin finds himself not only without his Dharma – life’s duty – but also deeply saddened by the death of his beloved spiritual guide and mentor. This temporary loss of bearing is soon overshadowed by his need to find the Lama’s latest incarnation, in a child that the Buddhist sages foresee as born of a certain father with a specific initial, possessing very special qualities and unmistakable taste. 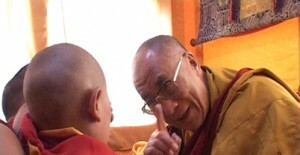 And the child must, of course, have been born after the death of the revered Rimpoche. So Tenzin embarks on a journey of discovery and while he finds the heir to this spiritual dynasty, he also unearths within himself the parental devotion he felt in the elder Rimpoche. The film officially opens this Wednesday at Film Forum in NYC, before slowly but surely taking over the whole of the US, one city at a time. For a special treat, check out the film this Wednesday, June 3rd or Thursday, June 4th. The director Nati Baratz will be present both days for the 8 p.m. screening and a Q & A session will follow the film. You can ask him all about the breathtaking cinematography, as well as the fascinating subject Tenzin – who BTW magically speaks perfect English! – and the “happy and fatty fatty” golden child who is guaranteed to take over your heart forever. As a bit of inside info, the US distributor of the film is Oscilloscope Laboratories, though Fortissimo Films is also introducing this beautiful film. For those who have been following the latest and greatest of the undeniably on fire Indian cinema, they are the proud new distribution parent of such wonderful films as Dev Benegal’s upcoming ‘Road, Movie’ – as well as Rajesh Jala’s documentary ‘Children of the Pyre’ which will be showing later this month at MoMA’s “The New India”. This entry was posted on Monday, June 1st, 2009 at 2:54 pm and is filed under Films 2 See. What a pity that we were not able to see this film at the recently held Buddhist Film Festival in London. I hope that a dvd of this film is released soon.